Click on the chart for in-depth premarket data. 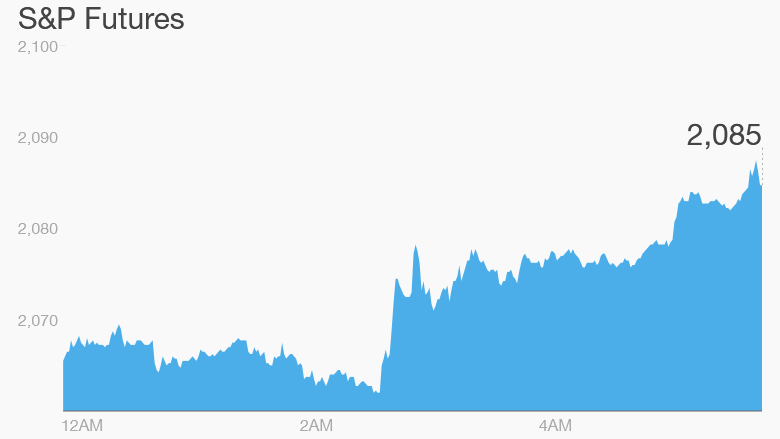 Markets are cheering Monday after Europe finally reached a deal to bailout Greece. European stocks bounced on the news and U.S. stock futures were also moving higher. 1. Greek deal: It took all night but Europe has struck a deal to rescue Greece. Eurozone leaders will negotiate a new $96 billion bailout after the country agreed to enact deep economic reforms under close supervision by its creditors. The deal -- if ratified -- should prevent a chaotic Greek exit from the euro, an unprecedented event that would have shaken Europe to its core. "The scale of the capitulation now being forced on Athens is breathtaking, with Greece effectively being asked to give up fiscal sovereignty as the price of staying in the euro area," Oxford Economics economist James Nixon said. European markets welcomed the news, while bonds in Greece and other peripheral euro nations also bounced. The euro trimmed earlier losses to trade around $1.11 against the U.S. dollar. 2. Oil tumbles: Crude prices sank to below $52 barrel in electronic trading as world powers appeared to be nearing a deal with Iran that could see supplies from the oil-rich nation back on the market. A deal would loosen sanctions in exchange for curbs on Tehran's nuclear program. Sanctions have long reined in Iran's oil production and exports, and the country is eager to shed those restrictions to boost its energy sector. 3. China rises: Stocks in China rebounded Monday, building on solid gains at the end of last week. But Chinese markets are likely to remain volatile this week and investors continue to weigh the impact of weeks of turmoil. 4. International markets: Greece-inspired gains washed over European markets. 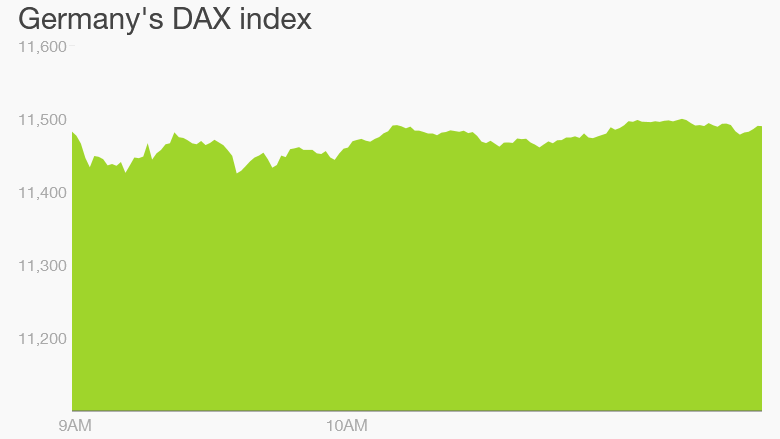 Germany's DAX index climbed 1.6%, France's CAC rallied 2.1%, and the U.K.'s FTSE index added 0.6%. Bank shares across the region were sharply higher, with Deutsche Bank (DB) up 2.7% and BNP Paribas (BNPQF) climbing 3%. Asian markets, some of which closed before the Greek deal was reached, also ended with solid gains. Japan's benchmark Nikkei index jumped 1.6%, while Seoul's KOSPI Composite climbed 1.5%. The Shanghai Composite added 2.4%. Sad news for Nintendo (NTDOF) as Satoru Iwata, the company's president, passed away at the age of 55. 5. Friday market recap: U.S. markets finished the week on a strong note. The Dow Jones industrial average and the S&P 500 both added 1.2%, while the Nasdaq advanced 1.5%.